The Saab 9-3 SportCombi BioPower was the second E85 flexifuel model introduced by Saab in the Swedish market. Ethanol-blended fuel is widely used in Brazil, the United States, and Europe (see also Ethanol fuel by country). Most cars on the road today in the U.S. can run on blends of up to 10% ethanol,  and ethanol represented 10% of the U.S. gasoline fuel supply derived from domestic sources in 2011. Furthermore, many used cars today are flexible-fuel vehicles able to use 100% ethanol fuel. 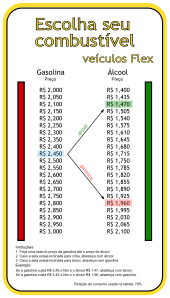 Since 1976 the Brazilian government has made it mandatory to blend ethanol with gasoline, and since 2007 the legal blend is around 25% ethanol and 75% gasoline (E25). By December 2011 Brazil had a fleet of 14.8 million flex-fuel automobiles and light trucks   and 1.5 million flex-fuel motorcycles    that regularly use neat ethanol fuel (known as E100). During ethanol fermentation, glucose and other sugars in the corn (or sugarcane or other crops) are converted into ethanol and carbon dioxide. Ethanol fermentation is not 100% selective with side products such as acetic acid and glycols. They are mostly removed during ethanol purification. Fermentation takes place in an aqueous solution. The resulting solution has an ethanol content of around 15%. Ethanol is subsequently isolated and purified by a combination of adsorption and distillation. Starch and cellulose molecules are strings of glucose molecules. It is also possible to generate ethanol out of cellulosic materials. That, however, requires a pretreatment that splits the cellulose into glucose molecules and other sugars that subsequently can be fermented. The resulting product is called cellulosic ethanol, indicating its source. Ethanol is also produced industrially from ethylene by hydration of the double bond in the presence of a catalyst and high temperature. Most ethanol is produced by fermentation. Bio-ethanol is usually obtained from the conversion of carbon-based feedstock. Agricultural feedstocks are considered renewable because they get energy from the sun using photosynthesis, provided that all minerals required for growth (such as nitrogen and phosphorus) are returned to the land. 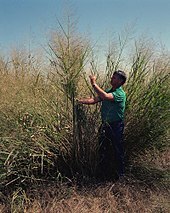 Ethanol can be produced from a variety of feedstocks such as sugar cane, bagasse, miscanthus, sugar beet, sorghum, grain, switchgrass, barley, hemp, kenaf, potatoes, sweet potatoes, cassava, sunflower, fruit, molasses, corn, stover, grain, wheat, straw, cotton, other biomass, as well as many types of cellulose waste and harvesting, whichever has the best well-to-wheel assessment. Currently, the first generation processes for the production of ethanol from corn use only a small part of the corn plant: the corn kernels are taken from the corn plant and only the starch, which represents about 50% of the dry kernel mass, is transformed into ethanol. Two types of second generation processes are under development. The first type uses enzymes and yeast fermentation to convert the plant cellulose into ethanol while the second type uses pyrolysis to convert the whole plant to either a liquid bio-oil or a syngas. Second generation processes can also be used with plants such as grasses, wood or agricultural waste material such as straw. Although there are various ways ethanol fuel can be produced, the most common way is via fermentation. Ethanol is produced by microbial fermentation of the sugar. Microbial fermentation currently only works directly with sugars. Two major components of plants, starch and cellulose, are both made of sugars—and can, in principle, be converted to sugars for fermentation. Currently, only the sugar (e.g., sugar cane) and starch (e.g., corn) portions can be economically converted. There is much activity in the area of cellulosic ethanol, where the cellulose part of a plant is broken down to sugars and subsequently converted to ethanol. Ethanol plant in Sertãozinho, Brazil. There are three dehydration processes to remove the water from an azeotropic ethanol/water mixture. The first process, used in many early fuel ethanol plants, is called azeotropic distillation and consists of adding benzene or cyclohexane to the mixture. When these components are added to the mixture, it forms a heterogeneous azeotropic mixture in vapor–liquid-liquid equilibrium, which when distilled produces anhydrous ethanol in the column bottom, and a vapor mixture of water, ethanol, and cyclohexane/benzene. When condensed, this becomes a two-phase liquid mixture. The heavier phase, poor in the entrainer (benzene or cyclohexane), is stripped of the entrainer and recycled to the feed—while the lighter phase, with condensate from the stripping, is recycled to the second column. Another early method, called extractive distillation, consists of adding a ternary component that increases ethanol's relative volatility. When the ternary mixture is distilled, it produces anhydrous ethanol on the top stream of the column. While biodiesel production systems have been marketed to home and business users for many years, commercialized ethanol production systems designed for end-consumer use have lagged in the marketplace. 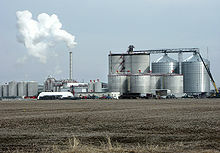 In 2008, two different companies announced home-scale ethanol production systems. The AFS125 Advanced Fuel System  from Allard Research and Development is capable of producing both ethanol and biodiesel in one machine, while the E-100 MicroFueler  from E-Fuel Corporation is dedicated to ethanol only. The Brazilian 2008 Honda Civic flex-fuel has outside direct access to the secondary reservoir gasoline tank in the front right side, the corresponding fuel filler door is shown by the arrow. Beginning with the model year 1999, an increasing number of vehicles in the world are manufactured with engines that can run on any fuel from 0% ethanol up to 100% ethanol without modification. Many cars and light trucks (a class containing minivans, SUVs and pickup trucks) are designed to be flexible-fuel vehicles using ethanol blends up to 85% ( E85) in North America and Europe, and up to 100% (E100) in Brazil. In older model years, their engine systems contained alcohol sensors in the fuel and/or oxygen sensors in the exhaust that provide input to the engine control computer to adjust the fuel injection to achieve stochiometric (no residual fuel or free oxygen in the exhaust) air-to-fuel ratio for any fuel mix. In newer models, the alcohol sensors have been removed, with the computer using only oxygen and airflow sensor feedback to estimate alcohol content. The engine control computer can also adjust (advance) the ignition timing to achieve a higher output without pre-ignition when it predicts that higher alcohol percentages are present in the fuel being burned. This method is backed up by advanced knock sensors – used in most high performance gasoline engines regardless of whether they are designed to use ethanol or not – that detect pre-ignition and detonation. Since 1989 there have also been ethanol engines based on the diesel principle operating in Sweden. They are used primarily in city buses, but also in distribution trucks and waste collectors. The engines, made by Scania, have a modified compression ratio, and the fuel (known as ED95) used is a mix of 93.6% ethanol and 3.6% ignition improver, and 2.8% denaturants. The ignition improver makes it possible for the fuel to ignite in the diesel combustion cycle. It is then also possible to use the energy efficiency of the diesel principle with ethanol. These engines have been used in the United Kingdom by Reading Buses but the use of bioethanol fuel is now being phased out. In a 2008 study, complex engine controls and increased exhaust gas recirculation allowed a compression ratio of 19.5 with fuels ranging from neat ethanol to E50. Thermal efficiency up to approximately that for a diesel was achieved. This would result in the fuel economy of a neat ethanol vehicle to be about the same as one burning gasoline. The world's top ethanol fuel producers in 2011 were the United States with 13.9×109 U.S. gallons (5.3×1010 liters; 1.16×1010 imperial gallons) and Brazil with 5.6×109 U.S. gallons (2.1×1010 liters; 4.7×109 imperial gallons), accounting together for 87.1% of world production of 22.36×109 U.S. gallons (8.46×1010 liters; 1.862×1010 imperial gallons). Strong incentives, coupled with other industry development initiatives, are giving rise to fledgling ethanol industries in countries such as Germany, Spain, France, Sweden, China, Thailand, Canada, Colombia, India, Australia, and some Central American countries. Compared with conventional unleaded gasoline, ethanol is a particulate-free burning fuel source that combusts with oxygen to form carbon dioxide, carbon monoxide, water and aldehydes. The Clean Air Act requires the addition of oxygenates to reduce carbon monoxide emissions in the United States. The additive MTBE is currently being phased out due to ground water contamination, hence ethanol becomes an attractive alternative additive. Current production methods include air pollution from the manufacturer of macronutrient fertilizers such as ammonia. The cost of the change in land use of the area where the fuel feedstock is grown. The amount of carbon dioxide produced at the tail pipe. The benefits due to the production of useful bi-products, such as cattle feed or electricity. 727–870 g/acre 87%–96% Long-season annual grass. Used as feedstock for most bioethanol produced in Brazil. Newer processing plants burn residues not used for ethanol to generate electricity. Grows only in tropical and subtropical climates. 780 g/acre 37%–73% Low-input perennial grass. Ethanol production depends on development of cellulosic technology. 330–810 g/acre 37%–73% Low-input perennial grass. Ethanol production depends on development of cellulosic technology. Breeding efforts underway to increase yields. Higher biomass production possible with mixed species of perennial grasses. 400–640 g/acre 51%–100% Fast-growing tree. Ethanol production depends on development of cellulosic technology. Completion of genomic sequencing project will aid breeding efforts to increase yields. 330–424 g/acre 10%–20% High-input annual grass. 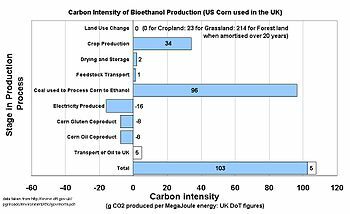 Used as feedstock for most bioethanol produced in USA. Only kernels can be processed using available technology; development of commercial cellulosic technology would allow stover to be used and increase ethanol yield by 1,100 – 2,000 litres/ha. Source (except those indicated): Nature 444 (7 December 2006): 673–676. [a] – Savings of GHG emissions assuming no land use change (using existing crop lands). One rationale given for extensive ethanol production in the U.S. is its benefit to energy security, by shifting the need for some foreign-produced oil to domestically produced energy sources. Production of ethanol requires significant energy, but current U.S. production derives most of that energy from coal, natural gas and other sources, rather than oil. Because 66% of oil consumed in the U.S. is imported, compared to a net surplus of coal and just 16% of natural gas (figures from 2006),  the displacement of oil-based fuels to ethanol produces a net shift from foreign to domestic U.S. energy sources. Leon Duray qualified third for the 1927 Indianapolis 500 auto race with an ethanol-fueled car. The IndyCar Series adopted a 10% ethanol blend for the 2006 season, and a 98% blend in 2007. In drag racing, there are Top Alcohol classes for dragsters and funny cars since the 1970s. Australia's V8 Supercar championship uses Shell E85 for its racing fuel. Stock Car Brasil Championship runs on neat ethanol, E100. J. Goettemoeller; A. Goettemoeller (2007). 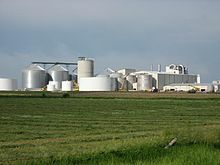 Sustainable Ethanol: Biofuels, Biorefineries, Cellulosic Biomass, Flex-Fuel Vehicles, and Sustainable Farming for Energy Independence (Brief and comprehensive account of the history, evolution and future of ethanol). Prairie Oak Publishing, Maryville, Missouri. ISBN 978-0-9786293-0-4. Onuki, Shinnosuke; Koziel, Jacek A.; van Leeuwen, Johannes; Jenks, William S.; Grewell, David; Cai, Lingshuang (June 2008). Ethanol production, purification, and analysis techniques: a review. 2008 ASABE Annual International Meeting. Providence, Rhode Island. Retrieved 16 February 2013. The Worldwatch Institute (2007). Biofuels for Transport: Global Potential and Implications for Energy and Agriculture (Global view, includes country study cases of Brazil, China, India and Tanzania). London, UK: Earthscan Publications. ISBN 978-1-84407-422-8. ^ "Towards Sustainable Production and Use of Resources: Assessing Bio fuels" (PDF). United Nations Environment Programme. 16 October 2009. Archived from the original (PDF) on 22 November 2009. Retrieved 24 October 2009. ^ a b c d e Renewable Fuels Association (6 March 2012). "Acelerating Industry Innovation – 2012 Ethanol Industry Outlook" (PDF). Renewable Fuels Association. Archived from the original (PDF) on 14 May 2012. Retrieved 18 March 2012. See pp. 3, 8, 10 22 and 23. ^ "Gasoline Gallon Equivalent (GGE) Definition". energy.gov. Retrieved 12 October 2011. ^ "Alternative Fuels Data Center – Fuel Properties Comparison" (PDF). Alternative Fuels Data Center. 29 October 2014. ^ "The Renewable Path to Energy Security" (PDF). Images1.americanprogress.org. Retrieved 20 January 2015. ^ "Portaria Nº 143, de 27 de Junho de 2007" (in Portuguese). Ministério da Agricultura, Pecuária e Abastecimento. Retrieved 5 October 2008. ^ "Anúario da Industria Automobilistica Brasileira 2011: Tabela 2.3 Produção por combustível – 1957/2010" (in Portuguese). ANFAVEA – Associação Nacional dos Fabricantes de Veículos Automotores (Brasil). Retrieved 22 January 2012. pp. 62–63. ^ Renavam/Denatran (January 2012). "Licenciamento total de automóveis e comerciais leves por combustível" [Total automobiles and light-trucks registered by fuel] (PDF) (in Portuguese). ANFAVEA. Archived from the original (PDF) on 31 January 2012. Retrieved 21 January 2012. Carta de ANFAVEA 308 pp. 4. ^ Abraciclo (27 January 2010). "Motos flex foram as mais vendidas em 2009 na categoria 150cc" (in Portuguese). UNICA. Archived from the original on 5 December 2012. Retrieved 10 February 2010. ^ "Produção Motocicletas 2010" (PDF) (in Portuguese). ABRACICLO. Retrieved 5 February 2011. ^ "Produção Motocicletas 2011" [2011 Motorcycle Production] (PDF) (in Portuguese). ABRACICLO. Retrieved 21 January 2012. ^ "Deforestation diesel – the madness of biofuel" (PDF). Retrieved 27 August 2011. ^ "The dirty truth about biofuels". Oilcrash.com. 14 March 2005. Retrieved 27 August 2011. ^ Kinver, Mark (18 September 2006). "Biofuels look to the next generation". BBC News. Retrieved 27 August 2011. ^ O. R. Inderwildi; D. A. King (2009). "Quo Vadis Biofuels". Energy & Environmental Science. 2 (4): 343. doi: 10.1039/b822951c. ^ a b "Industrial & Environmental" (PDF). Bio.org. Archived from the original (PDF) on 12 February 2006. Retrieved 20 January 2015. ^ a b "World Energy Outlook 2006" (PDF). Worldenergyoutlook.org. Archived from the original (PDF) on 28 September 2007. Retrieved 20 January 2015. ^ "World Fuel Ethanol Analysis and Outlook" (PDF). Meti.go.jp. Archived from the original (PDF) on 28 March 2016. Retrieved 20 January 2015. ^ "(grainscouncil.com, Biofuels_study 268 kB pdf, footnote, p 6)" (PDF). 18 July 2008. Archived from the original (PDF) on 18 July 2008. Retrieved 27 August 2011. ^ Martin LaMonica (12 June 2008). "Algae farm in Mexico to produce ethanol in '09". News.cnet.com. Retrieved 27 August 2011. ^ "New Enzyme for More Efficient Corn Ethanol Production". Green Car Congress. 30 June 2005. Retrieved 14 January 2008. ^ "Ethanol". University of Illinois Extension. Retrieved 10 July 2017. ^ Volpato Filho, Orlando (September 2008). Gasoline C made with Hydrous Ethanol. XVI SIMEA 2008 - Simpósio Internacional de Engenharia Automotiva. Sao Paolo. Retrieved 10 July 2017. ^ "Modern Corn Ethanol plant description" (PDF). ^ Stacey, Neil T.; Hadjitheodorou, Aristoklis; Glasser, David (19 September 2016). "Gasoline Preblending for Energy-Efficient Bioethanol Recovery". Energy & Fuels. 30 (10): 8286–8291. doi: 10.1021/acs.energyfuels.6b01591. ISSN 0887-0624. ^ This is shown for 25 °C (77 °F) in a gasoline-ethanol-water phase diagram, Fig 13 of Päivi Aakko; Nils-Olof Nylund. "Technical View on Biofuels for Transportation – Focus on Ethanol End-Use Aspects" (PDF). Archived from the original (PDF) on 3 December 2007. Retrieved 14 January 2008. ^ "Water Phase Separation in Oxygenated Gasoline" (PDF). Epa.gov. Archived from the original (PDF) on 9 February 2015. Retrieved 20 January 2015. ^ "Home Mini-Refinery Makes Ethanol & Biodiesel Simultaneously". Gas2.0. 4 November 2008. Retrieved 4 November 2008. ^ "Micro Fueler Is First Ethanol Kit for Brewing Backyard Biofuels on the Cheap". PopularMechanics. 8 May 2008. Archived from the original on 9 May 2008. Retrieved 8 May 2008. ^ "Alternative Fuels Data Center: Ethanol". Afdc.energy.gov. Retrieved 20 January 2015. ^ "U.S. Energy Information Administration (EIA)". Archived from the original (PDF) on 21 August 2008. Retrieved 2016-02-09. ^ "Ethanol in Petrol". Royal Automobile Association of South Australia. February 2004. Archived from the original on 9 June 2007. Retrieved 29 April 2007. ^ "EPA Info". US EPA. 7 March 2011. Archived from the original on 25 June 2009. Retrieved 27 August 2011. ^ a b c J. Goettemoeller; A. Goettemoeller (2007). Sustainable Ethanol: Biofuels, Biorefineries, Cellulosic Biomass, Flex-Fuel Vehicles, and Sustainable Farming for Energy Independence. Prairie Oak Publishing, Maryville, Missouri. p. 42. ISBN 978-0-9786293-0-4. ^ "EPA Mileage". Fueleconomy.gov. Retrieved 27 August 2011. ^ "Changes in Gasoline IV, sponsored by Renewable Fuels Foundation" (PDF). Archived from the original (PDF) on 2 August 2012. Retrieved 27 August 2011. ^ Roman M. Balabin; et al. (2007). "Molar enthalpy of vaporization of ethanol–gasoline mixtures and their colloid state". Fuel. 86 (3): 323. doi: 10.1016/j.fuel.2006.08.008. ^ "Sustainable biofuels: prospects and challenges". The Royal Society. January 2008. Archived from the original (PDF) on 5 October 2008. Retrieved 27 September 2008. Policy document 01/08. See 4.3.1 Vapour pressure and bioethanol and Figure 4.3 for the relation between ethanol content and vapor pressure. ^ Ethanol Promotion; Information Council (27 February 2007). "When is E85 not 85 percent ethanol? When it's E70 with an E85 sticker on it". AutoblogGreen. Retrieved 24 August 2008. ^ a b "Ethanol fuel and cars". Interesting Energy Facts. 23 September 2008. Retrieved 23 September 2008. ^ Vägverket (Swedish Road Administration) (30 May 2007). "Swedish comments on Euro 5/6 comitology version 4, 30 May 2007: Cold Temperature Tests For Flex Fuel Vehicles" (PDF). ec.europa.eu. European Commission. Archived from the original (PDF) on 3 October 2008. Retrieved 23 September 2008. ^ Agência Estado (10 June 2008). "Bosch investe na segunda geração do motor flex" (in Portuguese and English). Gazeta do Povo. Archived from the original on 10 January 2009. Retrieved 23 September 2008. ^ Q. Rodas (March 2009). "Volkswagen Polo E-Flex" (in Portuguese). Editora Abril. Archived from the original on 7 March 2009. Retrieved 12 March 2003. ^ "Volks lança sistema que elimina tanquinho de gasolina para partida a frio" (in Portuguese). UNICA. 12 March 2009. Archived from the original on 6 December 2012. Retrieved 12 March 2003. ^ "2011 Ethanol Industry Outlook: Building Bridges to a More Sustainable Future" (PDF). Renewable Fuels Association. 2011. Archived from the original (PDF) on 28 September 2011. Retrieved 30 April 2011. See pages 2–3, 10–11, 19–20, and 26–27. ^ Matthew L. Wald (13 October 2010). "A Bit More Ethanol in the Gas Tank". The New York Times. Retrieved 14 October 2010. ^ Fred Meier (13 October 2010). "EPA allows 15% ethanol in gasoline, but only for late-model cars". USA Today. Retrieved 14 October 2010. ^ "Ethanol Producer Magazine – The Latest News and Data About Ethanol Production". Ethanolproducer.com. Retrieved 20 January 2015. ^ Stokes, J.; Lake, T. H.; Osborne, R. J. (16 October 2000). "A Gasoline Engine Concept for Improved Fuel Economy -The Lean Boost System". SAE Paper 2001-01-2901. SAE Technical Paper Series. 1. Sae.org. doi: 10.4271/2000-01-2902. Retrieved 27 August 2011. ^ M. Brusstar; M. Bakenhus. "Economical, High-Efficiency Engine Technologies for Alcohol Fuels" (PDF). U.S. Environmental Protection Agency. Retrieved 14 January 2008. ^ a b Voelcker, John (14 June 2016). "Nissan takes a different approach to fuel cells: ethanol". Green Car Reports. Retrieved 16 June 2016. ^ F.O. Lichts. "Industry Statistics: 2010 World Fuel Ethanol Production". Renewable Fuels Association. Retrieved 30 April 2011. ^ "2009 Global Ethanol Production (Million Gallons)" (PDF). F.O. Licht, cited in Renewable Fuels Association, Ethanol Industry Overlook 2010, pp. 2 and 22. 2010. Archived from the original (PDF) on 18 July 2011. Retrieved 12 February 2011. ^ F.O. Licht. "2007 and 2008 World Fuel Ethanol Production". Renewable Fuels Association. Archived from the original on 8 April 2008. Retrieved 17 April 2010. ^ a b c d Joel K. Bourne, Jr. "Biofuels". Ngm.nationalgeographic.vom. Retrieved 20 January 2015. ^ "01.26.2006 - Ethanol can replace gasoline with significant energy savings, comparable impact on greenhouse gases". Berkeley.edu. Retrieved 20 January 2015. ^ "oregon.gov, biomass forum". Oregon.gov. 27 March 2009. Archived from the original on 28 August 2011. Retrieved 27 August 2011. ^ M. Wang; C. Saricks; D. Santini. "Effects of Fuel Ethanol Use on Fuel-Cycle Energy and Greenhouse Gas Emissions" (PDF). Argonne National Laboratory. Retrieved 7 July 2009. ^ M. Wang. "Energy and Greenhouse Gas Emissions Effects of Fuel Ethanol" (PDF). Retrieved 7 July 2009. ^ Davidson, Keay (18 April 2007). "Study warns of health risk from ethanol". San Francisco Chronicle. Retrieved 7 July 2009. ^ "Clearing the air on ethanol". Environmental Science & Technology. 18 April 2007. Archived from the original on 27 October 2008. Retrieved 14 January 2008. ^ M. Z. Jacobson (14 March 2007). 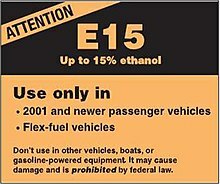 "Effects of Ethanol (E85) vs. Gasoline Vehicles on Cancer and Mortality in the United States". ACS Publications. Retrieved 14 January 2008. ^ Nguyen, H. (2001). "Atmospheric alcohols and aldehydes concentrations measured in Osaka, Japan and in Sao Paulo, Brazil". Atmospheric Environment. 35 (18): 3075–3083. doi: 10.1016/S1352-2310(01)00136-4. ^ a b c "Part One" (PDF). Archived from the original (PDF) on 24 November 2016. Retrieved 27 August 2011. ^ "Bioethanol Production and Use Creating Markets for Renewable Energy Technologies" (PDF). eubia.org. EU, RES Technology Marketing Campaign, European Biomass Industry Association EUBIA. 2007. Archived from the original (PDF) on 28 November 2007. ^ a b "Biofuels Deemed a Greenhouse Threat". The New York Times. Retrieved 20 January 2015. ^ Joseph Fargione (29 February 2008). "Land Clearing and the Biofuel Carbon Debt". Science. 319 (5867): 1235–1238. doi: 10.1126/science.1152747. PMID 18258862. ^ a b D. Morrison (18 September 2006). "Ethanol fuel presents a corn-undrum". University of Minnesota. Archived from the original on 22 September 2007. Retrieved 14 January 2008. ^ "Lula calls for ethanol investment". BBC. 4 June 2007. Retrieved 14 January 2008. ^ "Brazil's ethanol push could eat away at Amazon". Associated Press. 7 March 2007. Retrieved 14 January 2008. ^ D. Russi (7 March 2007). "Biofuels: An advisable strategy?". Archived from the original on 29 March 2008. 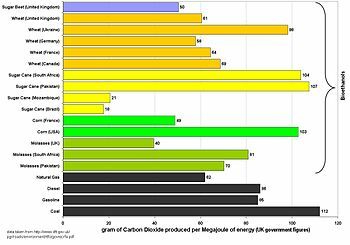 ^ Block, Ben, "Study: biofuels more efficient as electricity source. (EYE ON EARTH)(Brief article)" World Watch 22. ^ a b D. Budny; P. Sotero (April 2007). "Brazil Institute Special Report: The Global Dynamics of Biofuels" (PDF). Brazil Institute of the Woodrow Wilson Center (updated to Jan 2011). Archived from the original (PDF) on 28 May 2008. Retrieved 3 May 2008. ^ a b J. Duailibi (27 April 2008). "Ele é o falso vilão" (in Portuguese). Veja Magazine. Archived from the original on 6 May 2008. Retrieved 3 May 2008. ^ Belum V S Reddy; Kumar, A Ashok; Ramesh, S. "Sweet sorghum: A Water Saving BioEnergy Crop" (PDF). International Crops Research Institute for the SemiArid Tropics. Retrieved 14 January 2008. ^ "RP INVESTOR TO PUT UP PIONEERING SWEET SORGHUM ETHANOL PLANT". Manila Bulletin. 25 October 2006. Archived from the original on 12 February 2008. Retrieved 14 January 2008. ^ G. C. Rains; J. S. Cundiff; G. E. Welbaum (12 September 1997). "Sweet Sorghum for a Piedmont Ethanol Industry". Retrieved 14 January 2008. ^ "ICRISAT develops sweet sorghum for ethanol production". 12 August 2004. Archived from the original on 15 December 2007. Retrieved 14 January 2008. ^ "Energy Security" (PDF). Ethanol.org. Archived from the original (PDF) on 23 April 2012. Retrieved 27 August 2011. ^ M. Turon (25 November 1998). Ethanol as Fuel: An Environmental and Economic Analysis. U.C. Berkeley, Chemical Engineering. ^ "Ethanol Can Contribute to Energy and Environmental Goals" (PDF). Ethanol.org. Archived from the original (PDF) on 23 April 2012. Retrieved 27 August 2011. ^ "Energy INFOcard". Eia.doe.gov. Retrieved 27 August 2011. ^ "Ethanol Lowers Gas Prices 29–40 Cents Per Gallon". Renewableenergyworld.com. Retrieved 27 August 2011. ^ "Texas Students Win National Auto Repair Crown". Motor.com. Retrieved 20 January 2015. ^ "ALMS Corvettes going green with E85 fuel in 2008 - USATODAY.com". Usatoday30.usatoday.com. Retrieved 20 January 2015. ^ "Rocket Racing League Unveils New Flying Hot Rod". Space.com. Retrieved 20 January 2015. ^ "Impact of Improved Stoves and Fuels on IAP", CEIHD Center for Entrepreneurship in International Health and Development. Retrieved 30 May 2010. ^ Jim Lane (1 August 2013). "INEOS Bio produces cellulosic ethanol from waste, at commercial scale – print-friendly". Biofuels Digest. Retrieved 15 June 2014. ^ "Ethanol production using genetically engineered bacterium". Azom.com. 23 September 2010. Retrieved 23 April 2012. ^ "Air Pollution Rules Relaxed for U.S. Ethanol Producers". Environmental News Service. 12 April 2007. Retrieved 26 June 2009. ^ "Nano-spike catalysts convert carbon dioxide directly into ethanol | ORNL". www.ornl.gov. Retrieved 11 November 2016. "World Bank, Biofuels: The Promise and the Risks. World Development Report 2008: Agriculture for Development". econ.worldbank.org. Archived from the original on 16 May 2008.